My favorite birthday memory is the year my Dad made a special birthday breakfast just for me. At the time, my favorite breakfast happened to be FRIED DOUGH and nobody in the world can make it the way my Dad did. I was 10 years old and even though I was small for my age I had an enormous appetite! He made 2 pounds of dough; 1 pound just for me, the other for the rest of the family! Boy, I really enjoyed every morsel of that breakfast. Growing up, my Dad used to love telling that story and laugh about how I could eat and eat and never gain a pound! Now that age has caught up with me, I don't eat much Fried Dough. But to this day, I have never tried ANY that was as good as on my 10th birthday. In memory of Michelle's father who passed away fours ago on October 21st, Little Nipper Books will be donating a portion of the proceeds from the sale of Miss Mandy Manners during the month of October to the American Cancer Society. Click here to visit Little Nipper Books to make a purchase. Additionally, Michelle Berg wrote on her blog about books that may help explain the loss of someone to cancer - Click here to read her Top 10 Books. Picture books with social components can be a powerful tool for parents by providing an opportunity to discuss appropriate behaviors and expectations with their children. In this edition of Surprise Party, I will be introducing you to, Michelle Berg, author of Miss Mandy Manners. Her book gives parents one of these opportunities to talk about appropriate behaviors with the guidance of a great character, Miss Mandy Manners. Miss Mandy is well behaved at home, school, in public places and at her friend's house. As a result of these good choices Miss Mandy is well liked and has lots of friends. 1. How am I like Miss Mandy Manners? - A simple chart for parents/teachers to complete with a child to discuss how Miss Mandy Manners acts and how it is similar to their own behavior. 2. How can I be more like Miss Mandy Manners? - Another simple chart that allows parents/teachers to address target behaviors their child is exhibiting that are not like Miss Mandy Manners and discuss how they can be more like Mandy. 3. Miss Mandy Manners in different locations - A chart that provides an opportunity for parents/teachers to discuss appropriate behavior at different locations like home, school, in public, and a friend's house. 4. Behavior and Reward Chart - Use this chart and the Miss Mandy Manners icons to target and reward appropriate behavior. 5. Visual Reminder - Use this visual reminder as a non-verbal cue to redirect a child's behavior. Don't forget to come back to download your Miss Mandy Manners Lessons and Support Activities! Happy Birthday Author: How did you come up with the idea for your book? 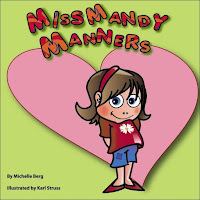 Michelle Berg: Miss Mandy Manners originated from the trials and tribulations of teaching my own daughter proper manners. She was 3 years old at the time and giving me a hard time! I wanted to write an entertaining book that parents could use as a teaching tool. Happy Birthday Author: What motivated you to write and follow through with publishing the book? Michelle Berg: My grandfather was an author. In 1972, he self-published a book entitled The Peabody Story. It became so popular that the schools in Peabody, Massachusetts used it as a textbook for several years. I’ve always been inspired by him. In 2002, he passed away and then I lost my Grandmother and my Dad. It was then that I began to write. I needed something positive in my life that would help me deal with my grief. Watching Miss Mandy Manners come into fruition has seen me through the hard times and has brought me to a new future. Michelle Berg: It was a very proud feeling of accomplishment. This book took me 2 years to get published! I’ve wanted to be an author since I was a child. This was a dream come true. Happy Birthday Author: Could you tell me more about Little Nipper Books? Michelle Berg: Little Nipper Books ("Like" on Facebook) is an independent publishing company for educational children’s literature. In November of 2009, we released Miss Mandy Manners, an Early Picture Book for age’s preschool-8. This will be the start of many books available for children of all ages including Easy Readers, Chapter Books and books for Young Adults. We at Little Nipper Books believe that children learn when they are having fun. Therefore, our primary goal is to entertain. Our books will resonate with parents and young children alike. They will help children associate reading with fun and see the activity as enjoyable rather than as a chore. Miss Mandy Manners is the perfect example of our mission. Its unique design and fun rhythmic narrative will catch the attention of even the youngest audience. Whether the subject be behavioral, social studies, science or early literacy, our books will generate big smiles and function as great tools for parents and teachers. Happy Birthday Author: Could you tell me about the other resources Little Nipper Books offers? Michelle Berg: In addition to publishing children’s books Little Nipper Books also offers free resources for parents and teachers on our website such as curriculum ideas for the classroom and a parenting blog. The primary aim of this blog is to be a guide for new parents. It covers book reviews (Children’s and Parenting); reviews on local museums and fun family outings as well open discussions on hot parenting issues with links to other related sites. Happy Birthday Author: You are also a preschool teacher. What are some things you could recommend to parents of preschoolers to encourage a positive reading environment in the home? Michelle Berg: I would recommend establishing a “story time” in your everyday routine. Let your children take the lead. Every child is different; some are more receptive to story time in the morning, some as they are winding down before bed. Let them chose the story they would like to hear. Lastly, read with enthusiasm! Even the dullest books can become entertaining if you read with energy. Happy Birthday Author: Do you have children? If you do...what are your routines of reading in your house? Michelle Berg: Yes! I have 2 beautiful children! We read, as a family, on the sofa before bedtime. They each chose two stories. Occasionally my husband will read but mostly I do because I enjoy it so much! Happy Birthday Author: We are all about birthdays at Happy Birthday Author. When is your birthday? Michelle Berg: As a child, birthdays were a big deal in our household! My grandparents always came over to help us celebrate. I didn’t like birthday cake so my Mom would make homemade strawberry shortcake with real whipped cream! And my Dad would have us all laughing with one of his silly stories. Happy Birthday Author: Any other thoughts, life lessons, interesting tidbits you would like to share about being author/teacher, etc.? Michelle Berg: Follow your dreams, a little each day. Success comes in small doses.